Great content and swoonworthy graphics will attract people to your blog. Heck, they’ll even convince visitors to stick around long enough to check out what you have to offer. But when it comes to making your blog convert—whether this means gaining email subscribers, generating leads, or making sales—there’s something else you need: rock-solid calls to action (CTAs). What kinds of CTAs should you test to make your blog more successful and profitable? Check out these 8 effective types of blog CTAs. Need some help writing powerful calls to action your audience can’t resist? Download my 80 free call-to-action templates for blogs, websites, and social media. These days, it’s common to use blogs to generate leads or email subscribers. That’s why you’ll often see lead magnet CTAs used as blog CTAs. Lead magnets are free resources, such as worksheets, checklists, and templates, that bloggers and entrepreneurs offer on their blogs in exchange for a visitor’s contact info. Most blog visitors won’t hand out their contact info unless they know they’re getting something valuable in return. Lead magnets are valuable, high-quality resources that incentivize people to share their email address or phone number. For example, if you’re an event planner, you might offer an event planning checklist as a lead magnet to encourage your blog visitors to sign up for your email list. Where to place them: You can place lead magnet CTAs on your home page, in your sidebar, and at the bottom of blog posts. You can also offer them in pop-ups and slide-in CTAs. Example: Check out this lead magnet CTA on Nesha Woolery’s home page. Like lead magnet CTAs, content upgrade CTAs are also common blog CTAs. However, they can be even more effective than lead magnet CTAs. In fact, when Brian Dean of Backlinko first added content upgrades to his blog, his conversions increased by a whopping 700%! Because whereas lead magnets are general free resources, content upgrades are free resources that are tailored to the blog posts they’re featured on. For example, on an event planning blog, you might offer a venue selection worksheet as a content upgrade on a blog post about how to select the right venue. And on a blog post about how to word invitations, you might offer invitation copy templates. Where to place them: Content upgrade CTAs are most effective when visitors have already consumed some of the relevant content on your blog. For this reason, it’s strategic to place content upgrade CTAs at the bottom of blog posts or in the middle of them. 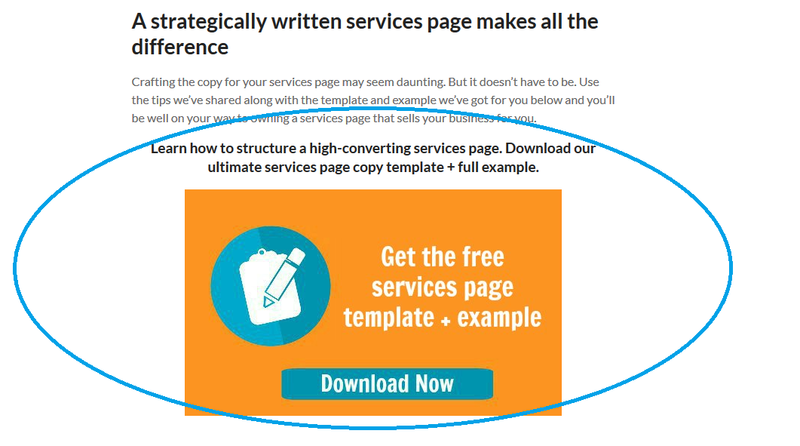 Example: I place content upgrade CTAs in the middle and at the end of my blog posts. As I mentioned above, you’re much more likely to get email subscribers or leads if you offer a lead magnet or content upgrade as an incentive. That said, if you’ve got epic content, just getting email alerts about new blog posts or VIP tips may seem like awesome value to your audience. How can you optimize the impact of these blog CTAs? Highlight the benefit subscribers will get (e.g., weekly tips delivered to their inbox). And provide social proof (“Join 10,000 people who receive…”). Where to place them: You can place blog and newsletter subscription CTAs on your home page, in your sidebar, and at the bottom of blog posts. You can also offer them in pop-ups and slide-in CTAs. Example: Crazy Egg placed a newsletter subscription CTA at the end of this blog post. Want to encourage engagement right on your blog posts? These are the blog CTAs to use. Comment CTAs encourage your visitors to share their thoughts on your blog post. You can either prompt visitors to share whatever comments they may have or ask them a specific question. In addition to encouraging engagement, comment CTAs can be a great way to get feedback on your blog posts and learn about your blog audience. Where to place them: At the end of blog posts. Example: MintSwift uses this question to encourage comments on her blog post about Google Analytics. Unless you’re a brand-spanking-new entrepreneur or blogger, you’re probably on at least one social media platform. That’s why it makes sense to add these social media share CTAs to your blog. These blog CTAs encourage people to share your content on social media. And you know what happens when people share your content on social media? You get more traffic, clicks, and conversions. You also get an SEO boost because social shares tell search engines that your content is valuable and high in quality. Want to make it insanely easy for your visitors to share your blog posts on social media? Add social media share CTAs to your posts using ClickToTweet. This tool lets visitors instantly share a pre-written tweet about your blog post with their followers. Where to place them: You can add social media share CTAs in the middle or at the end of blog posts. You can also add them as social media share buttons that automatically appear on each new blog post. Example: I use the Social Warfare plugin to add social media sharing buttons on all of my blog posts. In addition to making it easy for my visitors to share my content, this plugin adds social proof by displaying the number of people who have shared each blog post. Want to expand your following on social media? Add social media follow CTAs to your blog. These blog CTAs encourage visitors to follow you on one or more social media platforms. How can you sweeten the pot for visitors and boost your conversions with these CTAs? Highlight the unique benefits of following your brand on a particular platform. For example, mention that you share daily tips on your Instagram account or post new tutorials on your YouTube account every week. Where to place them: These blog CTAs tend to work best as buttons that appear in headers, footers, or sidebars. Example: HubSpot places its social media follow buttons in its footer. Think you need to offer more value before you can ask visitors to sign up for your email list or register for your free workshop? Consider adding read more CTAs to your blog posts. These blog CTAs direct visitors to related content on your blog, such as blog posts, infographics, or resources on a similar topic. Including read more CTAs allows you to keep visitors on your blog longer and give them even more value. Where to place them: Place these blog CTAs in the middle or at the end of blog posts. Example: See how Dr. Axe directs readers to another relevant blog post when they get to the end of this one. Depending on who your audience is and what you’re selling, you may be able to start pitching paid products or services right on your blog posts. Want to see if this would work for your brand? Try adding learn more CTAs to your blog. These blog CTAs encourage visitors to get more information about a product or service that’s relevant to the content they just read. In my event planning example, a blog post about why it’s helpful to hire an event planner could end with a CTA that pitches the brand’s event planning services. Example: This CTA on Melyssa Griffin’s blog directs visitors to a relevant paid product. CTAs may seem like just one small part of your blog or blog posts. 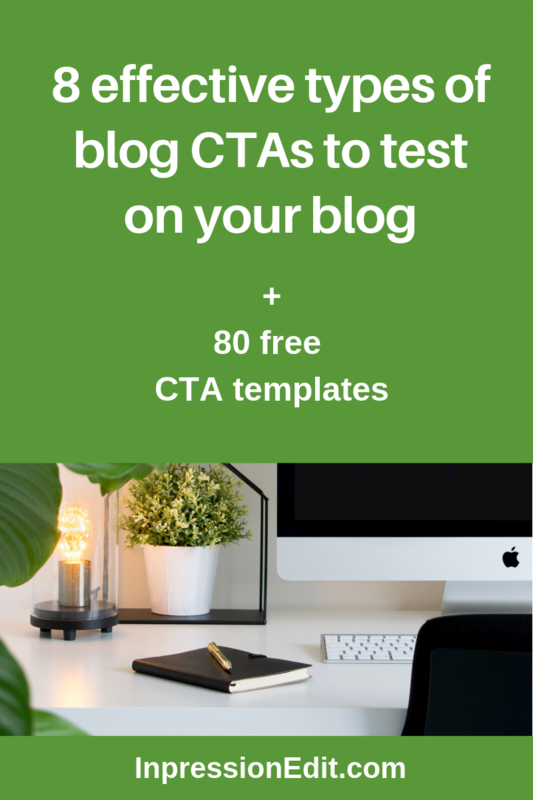 But the reality is that CTAs are the key to turning your blog into a tool that generates subscribers, customers, and sales. 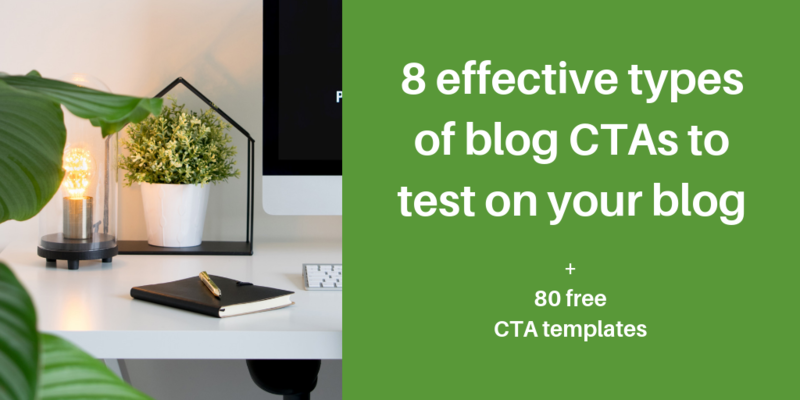 That’s why it’s an awesome idea to test out these 8 blog CTAs on your blog. Although different ones will work best for different audiences, niches, and types of content, they’ll help you boost conversions on your blog so you can crush your business or blog goals. Hi there. I was trying to subscribe and download the CTA templates, but none of the download links worked for me. Not sure what the problem is, but I’d still like to subscribe and have the freebies. Suggestions…? Thanks for reaching out! I’m sorry that you were having trouble accessing the resource. I just sent you an email with the resource. I’ve also subscribed you to my list manually.